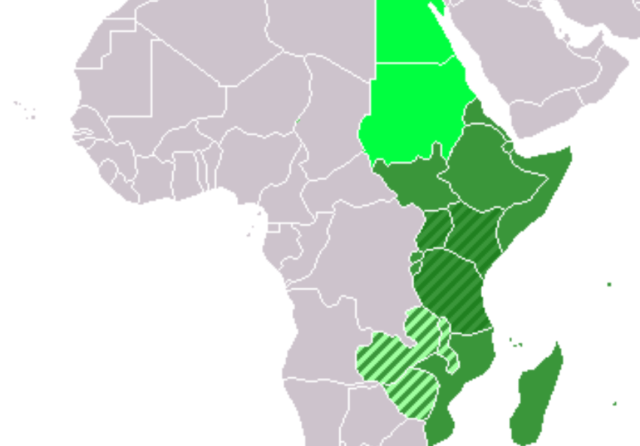 Just as the name sounds, East Africa is located at the Eastern part of Africa with part of it extending to cover a prominence on the African map called the horn of Africa. It is also referred to as Eastern Africa. According to the United Nations, there are 20 African nations that make up East African countries. This is slightly different from the geographic classification which is much more different from the modern but “unconventional English” classification of East Africa referring to Kenya, Tanzania and Uganda. East African countries hold a lot to the human origin, for instance, It is strongly believed that modern humans once lived in East Africa before migrating out of the continent. Most countries in the region were colonized by the United Kingdom, Germany, Portugal, Belgium and France, and there are diverse cultural and religious differences with each East African country having as much cultural and traditional diversity despite being colonized by a few nations. This demonstrates the depth of cultural roots in the East African region. Burundi is also known as The Republic of Burundi with Bujumbura as its capital. It is one of the countries in East Africa though it is sometimes considered a part of Central Africa.It is a landlocked country, however, much of its southwestern parts lie close to Lake Tanganyika. Burundi is closely related to other East African countries and has Rwanda on its northern part, the Democratic Republic of the Congo forms the western border while Tanzania lies to the eastern and southern part. The old kingdom of Burundi was later colonized by Germany and Belgium which occupied the region to form a European colony regarded as Ruanda-Urundi. It is worthy of note that Burundi is one of the poorest countries in Africa and is also close to the bottom when compared to other countries of the world with one of the most unimaginable per capita GDP of any nation in the world. It has witnessed many wars, violence, hunger and famine. Tanzania is also known as the United Republic of Tanzania and is one of the countries in East Africa by all classifications. Its capital city is Dar es Salaam. It is bordered on the north by Uganda and Kenya while Burundi, Rwanda and the Democratic Republic of the Congo form the country’s border at the western end. Zambia, Malawi, and Mozambique form the southern border of the country while its remaining eastern border is shared with the Indian Ocean. Tanzania is known to have some of the most intriguing natural attractions in Africa including Mount Kilimanjaro: the highest mountain in Africa which is on its northeastern part. Kenya is a sovereign state in East Africa and is officially known as the Republic of Kenya with Nairobi as its Capital and largest city by population. The country lies on the equatorial region and is bordered by the Indian Ocean to the south-east and Tanzania to the south, Uganda lies on the west while South Sudan is located at the north-western part of Kenya, Ethiopia to the north and Somalia to the north-east. Kenya is best known for amazing safari experiences and is one of the recommended romantic destinations for young couples because of diverse wildlife in the country. Uganda is one of the well-known and well-remembered nations in East Africa most especially because of one of the most famous dictators: Idi Amin who went by the unforgettable title of: “His Excellency, President for Life, Field Marshal Al Hadji Doctor Idi Amin Dada, VC, DSO, MC, Lord of All the Beasts of the Earth and Fishes of the Seas and Conqueror of the British Empire in Africa in General and Uganda in Particular”. Geographically, Uganda is bordered on its eastern side by Kenya, on the west by the Democratic Republic of the Congo (DRC),on the north by South Sudan, on the southwest by Rwanda, and on the south by Tanzania with parts of Lake Victoria. Uganda has seen many wars including with neighbouring country like Tanzania. Also, there are terror groups operating in the country including the famous Joseph Kony’s Lord’s Resistance Army; a group that have committed several atrocities against humanity. Uganda is rated among the top countries perceived as very corrupt by Transparency International which placed it at 29 on a scale from 0 (perceived as most corrupt) to 100 (perceived as clean). Rwanda is sometimes considered to be a part of Central Africa however, it is officially grouped under East African countries. She gained her independence from Belgium on 1st July 1962. The country has an estimated population of about 12 million with up to 85% speaking Hutu language and 15% speaking Hutsi. Djibouti is one of the countries located in the horn of Africa with Eritrea bordering the north and Gulf of Aden at the eastern border. It shares the western border with Ethiopia while Somalia borders the southeastern end. The remaining border not covered by land is bordered by the Red Sea. The official languages are French and Arabic and their population is getting close to a million (about 942,333) based on World Bank statistics. Eritrea is another country in the Horn of Africa. With 6 million people living there, its population is much bigger than that of Djibouti. There are cultural and language differences within Eritrea with up to 9 different ethnic groups present which are distributed as 55% Tigrinya, 30% Tigre, 4% Saho, 2% Kunama, 2% Bilen, 2% Rashaida, 5% others. Ethiopia is also a country in the horn of Africa with more than 93,000,000 inhabitants making it the second most populous country in Africa after Nigeria. The capital city is Addis Ababa and Amharic is the official language. Ethiopia became the first African country to defeat the European colonial powers to retain its independence at a time when most other African countries were being colonized. Somalia is strategically located among the East Africa countries. It is shaped like the number “7” and it occupies the most of the horn of Africa. Somalia has the longest coastline on the mainland because of its land shape and it shares a long border with the Indian ocean and forms the Gulf of Arden with Yemen. Its population is about 10 million. The country has been ravaged by wars and terrorism and the coastal lines of Somalia are one of the most dangerous due to high pirate activities in the region who would often kidnap individuals in exchange for ransom. Mozambique needs no introduction as a country colonized by Portugal because of its name. It is an East African country but is often considered as part of southern Africa. Mozambique had her independence from Portugal on 25th June 1975 and adopted Portuguese as the official language but has other vernacular languages which include: Tsonga, Ronga, Chopi, Tonga, Ndau, Tswa, Swahili, Makhuwa, Sena. There are about 24 million people living in the country and most are Christians, with significant minorities following Islam and African traditional religions. Madagascar is an island on the Indian Ocean. Geographically, it is positioned on the south-eastern part of Africa but is grouped as a country in East Africa according to UN scheme of geographic regions. The country is among the most favourite holiday destinations for Africans and non-Africans due to its amazing white sandy beaches and clear blue ocean. Lots of wildlife also abound in the nation and despite its small geographic size, it has an impressive population of over 22 million people. Malawi was formerly known as Nyasaland and has a population of almost 17 million people living within the confines of its borders. It is often referred to as the warm heart of Africa and seem to have enjoyed some level of peace more than the surrounding nations. Malawi is one of the poorest and least developed countries in Africa but is one of the few to have had a woman as the nation’s president. Zambia is located at the Southern Africa but is regarded as an East African country with Lusaka as its capital. Among its borders include: Democratic Republic of the Congo (DRC) to the north with Tanzania lying on its north-eastern end. The eastern border is occupied by Malawi while Mozambique, Zimbabwe, Botswana and Namibia lie on its southern part with Angola bordering the west. The population of Zambia is in the range of 14 million and is mainly concentrated around the capital (Lusaka) in the south and the Copperbelt Province on the northwestern end. Zimbabwe is often included as part of Southern Africa, and was formerly part of the Central African Federation. There are 16 official languages spoken in the country with English, Shona and Ndebele being most common. Zimbabwe declared independence on 11 November 1965 but took until 18 April 1980 to become recognized as a sovereign state. There are about 13 million people living in Zimbabwe and are mostly of Shona (82%) origin followed by Ndebele which make up 14%. Comoros is one of the small island countries in the Indian ocean. It is officially known as the Union of the Comoros and has a population of less than a million. Comoros is the third smallest African country by land mass. There are 4 major islands in the volcanic Comoros archipelago and they include: northwesternmost Grande Comore (Ngazidja); Mohéli (Mwali); Anjouan (Nzwani); and southeasternmost Mayotte (Maore). It is worthy of note that Mayotte is not part of the islands administered by the Comoros government rather the region continues to be administered by France which currently acknowledges is its overseas department. Mauritius is another small island country positioned in the Indian ocean. The closest distance to land which is the shores of the southeastern part of Africa is about 2,000 Kilometers. The country does not have any official language but among the vernacular language is Mauritian Creole. English and French is also widely spoken in the country. Seychelles is a small island country in the Indian Ocean. It is well-known for its clear blue ocean which presents a welcoming location for the very many tourists visiting the country. The official languages spoken include: French, English and Seychellois Creole as the vernacular. Seychelles is the smallest country in Africa judging by its population which is more of a handful of about 86,000 people however, it has the highest Human Development Index in Africa. Réunion as the name goes needs no introduction as a French country. It is located to the east of Madagascar in the Indian ocean. It is an overseas department of France in Africa with the same status as France in Europe, It has a population of 840,000 people. Mayotte is a French overseas territory also in the Indian Ocean. There are just a little over 200,000 people living on the island and the official language is French which is spoken among other popular vernacular languages like: Shimaore and Kibushi. South Sudan recently had her independence from Sudan after years of trying to gain autonomisity for itself from Sudan. It wasn’t until 9 July 2011, that South Sudan became recognized by the United Nations as a nation following a referendum that passed with 98.83%. The country is also recognized as a member of the African Union. The current capital is Juba and there are about 8 million (disputed 2008 census) people living in the country.